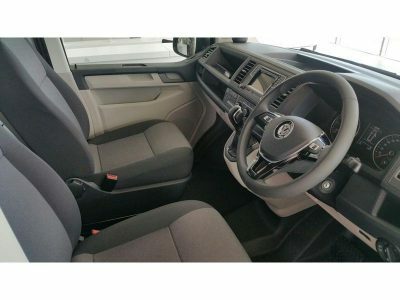 If you’re interested in the latest VW Transporter, then you probably won’t be intending on carrying many bagatelle items inside the cavernous van cargo area. 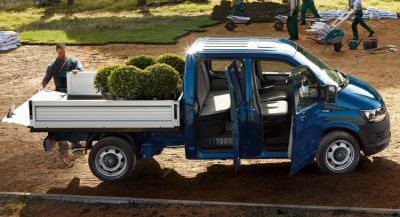 These are Volkswagen’s fabulous workhorses made for carrying all types of cargo and goods for businesses. Keeping the business world ticking over nicely is what VW vans and Cab Chassis vehicles do best. Powerful engines, big load carrying ability and plenty of choice allow for buyers of the new VW Transporter range to express their business in a professional and stylish manner. Functional and right-ready to work, the line-up of 2017 Volkswagen Transporter models also provide clean striking lines that are modern and stylish – just what you need to give your business a bit of a visual lift. The Transporter Van is highly configurable. You simply choose the roof height, door type, window packages and floor covering. Appearance packages as well as suspension upgrades, electrical interface selections, a second battery and more options are available. Volkswagen are very happy, and flexible, to help you set up your new VW Van just the way you want. There is a multitude of ways you can set the van up, and with the capability of carrying between 5.8 m3 and 9.3m3, the Transporter Van is a class-leading carrier. Even the short wheelbase model fits 2 euro pallets in the back. If added traction is what you require, then you’ll even be able to tackle some pretty serious off-roading to get to an out-of-the-way work site. 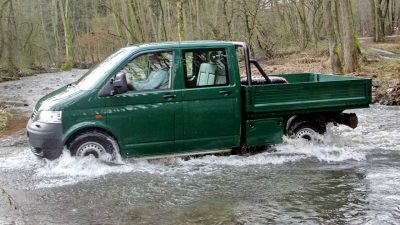 Thanks to Volkswagen providing the Transporter Van and Cab Chassis with a 400TDI AWD model, there is plenty of power and traction for getting the job done. The mechanical differential lock makes starting up in adverse, off-road conditions much easier. It’s optionally available with 4Motion for the rear axle. All Transporter models come with a handy Hill Start Assist mechanism that makes uphill starts very easy. The system will hold your car stationary for 1.5 seconds after the foot brake is released by temporarily locking the brake pressure. Prod the accelerator and away you go whatever the incline might happen to be. Loaded with heaps of modern and useful technology, the 2017 VW Transporter variants come with features like Driver Fatigue Detection, Multi-Collision braking (Brakes automatically after a collision to minimise further damage. ), park assist, rear park distance control, a rear-view camera, traction control, ABS, EBD, BA, electronic diff-locking for amazing control, an Electronic Stabilisation Programme, and even BlueMotion which offers start/stop engine technology for maximum fuel economy in congested traffic systems. The engines in the 2017 VW Transporter line-up provide impressive performance and improved fuel consumption. Features like 4MOTION all-wheel drive, dual clutch gearbox DSG, and Hill Start Assist make the new Transporter the most off-road-ready vehicle in its class. Power comes from two 2.0-litre diesel engine variants. The TDI340 offers 103 kW of power and 340 Nm of torque, while the TDI400 boasts a bi-Turbo engine with up to 132 kW and 400 Nm of torque. One of the noticeable characteristics of these modern 2.0-litre VW diesel engines is that they are powerful off the mark and super smooth. On average you should find either engine should get you less than 8 litres/100 km in a combined open road/city driving environment. Volkswagen back their workhorse fleets with an excellent 3 year/unlimited km warranty for purchasers of a new vehicle. Along with the extensive new vehicle warranty comes three years of roadside assistance for free. This is a nice package for positive peace-of-mind motoring. 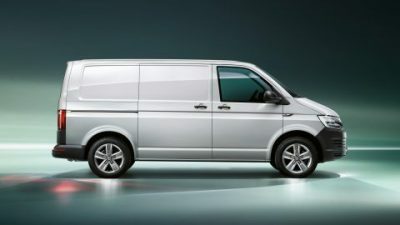 Van options include the Transporter Van with the two seats in the front and massive load carrying ability in the rear. The other option is for the van to accommodate two rows of seats and then a large carrying capacity behind the second row. 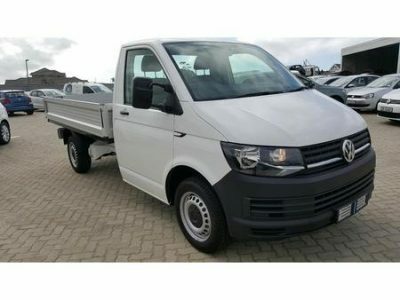 The single cab-chassis Transporter has two front seats and a long carry tray out the back, while the VW dual cab-chassis will be popular with its ability to carry plenty of items on the tray out back, while offering roomy seats for second row occupants. For buyers of VW Transporter Vans there are three roof heights available; the highest roof is found in the High Roofline Long Wheelbase FWD van model. Standard roof height and medium roof heights are the other options. Sixteen and seventeen inch wheels are available, while there is also a special Driver Assistance Package with power folding mirrors (short wheelbase Van and Crewvan only), front fog lights with static cornering function, and a Light and Vision system that boasts an auto-dimming inside rear view mirror. Automatic headlight activation with separate daytime running lights, a “Leaving Home” and manual “Coming Home” lighting feature also comes with this package; and rain sensing wipers finish the Driver Assistance package off nicely. An Interior Comfort Package offers height adjustment and lumbar support (manually adjustable) for front passenger occupants. 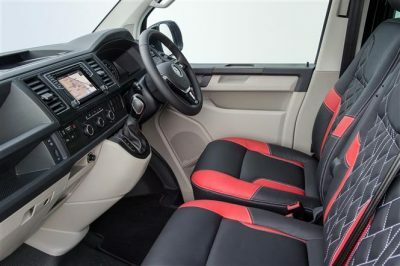 Armrests for driver and front passenger seats, grab handles on the A pillar for driver and front passenger (standard for single cab and dual cab), vanity mirrors for left and right sun visors and a 12-volt socket on the upper dashboard complete the compendium. A Load Platform Package is available for Cab Chassis buyers, where the load platform comes with aluminium sides, retaining cables and a rear step. Rear mud guards are provided with under chassis protection plates. If you drive a new Transporter then you’ll enjoy some nice comforts. The modern Transporter comes with cruise control, air-conditioning, an in-car entertainment system with premium sound and a 5-inch touch screen as standard. The touch screen can be upgraded, along with features like AppleCarPlay, Android Auto and Mirror Link also available on request. Bluetooth phone connectivity with contacts display and bluetooth audio-streaming come as standard features – and so too does a multi-function display screen. For what is arguably the best van and cab chassis experience for the serious load carrier, the brand new 2017 VW Transporter lives up to its name. The ride and composure is excellent, while the 2.0-litre turbo-diesel engines are smooth, powerful and efficient. For any more information on the latest VW Transporter models or, for that matter, any other new vehicle, contact one of our friendly consultants on 1300 303 181. If you’d like some fleet discount pricing (yes even for private buyers! ), we can submit vehicle quote requests out to our national network of VW dealers and come back with pricing within 24 hours. Private Fleet – car buying made easy!